Cross Waves Church Global Mission is to start and strengthen ministries around the globe that lead people to become more like Christ. Strive to empower those in need through employment, education and coaching. Listen closely to those we seek to help, especially to what is not being said— unspoken feelings may contain essential clues to effective service. Above all, do no harm to the economic landscape of the community. Christ is using Lorraine's ministry to change the lives of these children. Lorraine Cockrell runs an Edu-Fun program within Slavo Park. 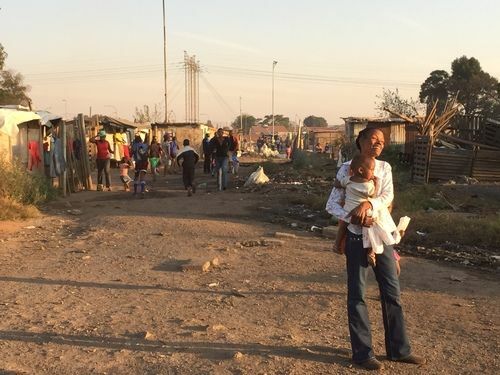 South Africa as a whole is rated last in the world when it comes to literacy, and it is even worse in Slovo. She teaches these children manners, to money management, reading, and healthy hygiene. 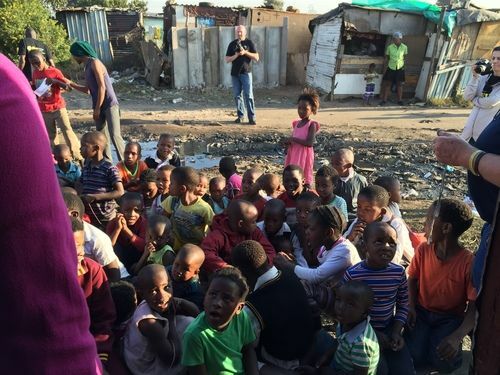 A Cross Waves team has traveled to South Africa to see her ministry first-hand. Christ is using her ministry is to change the lives of these children. Ludie and Barbara Creech, along with the four children, Griffin, Ruth, Emily and Lila have been serving in Ireland since 2009. Ludie and Barbara, were raised in NC where they met in college. They were married in 1997, and moved to Atlanta, GA for work in 2002. While in Atlanta, Ludie and Barbara surrendered to God’s call to ministry, and began to serve with Operation Mobilisation in Ireland in January, 2009. Restoration Place will bring the love of God’s healing power to those who have been tragically impacted by Human Trafficking. Our call to service is based on Christian values, to be upheld with the highest of ethical standards. We will use love, patience, grace, forgiveness and wisdom to guide even our most simplest of decisions. We will keep the love of Christ and the love He has for all His people at the forefront of our business operations, always keeping in mind that our goal is to restore the hope that has been lost. The Anderson's work in partnership with public and Christian groups throughout the country, facilitating Community Health Evangelism (CHE) teams. Daily ministry with Ivorians includes modeling disease prevention and good nutrition, demonstrating microenterprise and Farming God’s Way, and sharing Jesus in word and deed. Individual lives are changed physically, spiritually and socially by Christ. Local churches grow and show community transformation that endures and improves throughout generations. Our passion is to further fuel and equip West African CHE teams who strive to multiply hope in their neighborhoods, their country, and their continent. John & Nykia Smith lead Shepherds Fold Church. Shepherds Fold strives to become a self-supporting, missionary-minded, worship based community. We continue to build the Kingdom of Christ and our community through the ministry of justice, mercy and reconciliation. We are a House of Prayer for the nations that establishes relationships and ministries of compassion. Grace Centers of Hope is a non-profit, Christian organization committed to positively changing the lives of the unwanted, addicted, and homeless through the Gospel of Jesus Christ, personal accountability, life skills education, and work-related programs. The foundation of change is the local church which encourages residents to become strong in faith and independence while it lovingly promotes a sense of belonging within a community that truly can be called "home".